This coming weekend Americans celebrate Memorial Day. It is a holiday that for most of us marks the beginning of summer. If you live in the northern part of the U.S., Memorial Day marks the opening of pools, lakeside patios and other places that bring back those fond memories of childhood. In Florida, it marks the beginning of Hurricane season as well as the beginning of our summer season. Memorial Day started after the American Civil war in the late 1860s. It was first called Decoration Day at Arlington National Cemetery by then General James Garfield. General Garfield held the first Decoration Day in 1868 “Decorating” with flowers the graves of American Soldiers who died in the Civil War. It wasn’t until 1968, however, that the United States Congress passed the Uniform Monday Holiday Act which established Memorial Days as the last Monday in May. This change was effective as of 1971. Although many towns claim to have celebrated the first Memorial Day, the U.S. Government only officially recognizes the town of Waterloo, New York as the official birthplace of Memorial Day. Check out their website here. Today, the United States has 135 national cemeteries located in 40 states and Puerto Rico. The Cemeteries are managed by the U.S. Department of Veterans Affairs National Cemetery Association. Florida has 9 National Cemeteries. 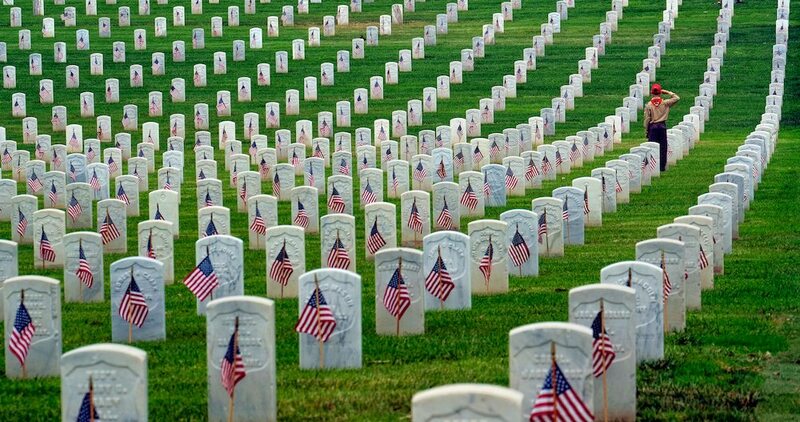 Any member of the Armed Forces of the United States who dies while on active duty or any Veteran who was discharged under conditions other than dishonorable may be eligible for burial in a National Cemetery. This Memorial Day, take a moment to pray for those defending our country who are still in harm’s way. Also, take a moment to remember those who fought or have served the United States Military. These are the individuals who laid their lives on the line to protect those freedoms enumerated in the Constitution of the United States of America. The attorneys and staff of Wetherington Hamilton, P.A. celebrate this Memorial Day with our families and friends and we thank all those who serve or who have served this great Nation. Wetherington Hamilton founding attorney, Theodore J. Hamilton, has over 20 years of experience in handling real estate transactions and litigation. Attorney Hamilton has particular experience in matters involving complex litigation and complicated real estate matters having represented title insurance companies and individuals throughout the state of Florida. He can be reached by phone at (813) 676-9082 or via email at TJH@whhlaw.com.